The landscapers like to call it "hardscape", all those walls, patios, paths and other features that help to define the places in between the gardens and give us places to rest and walk. 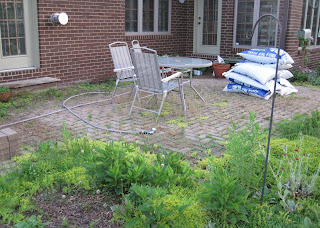 The current patio is a mess, and not just because I let it go this spring, so to speak. Let me point out how flawed it is. - It is too small. There is barely room for a table and chairs and a few containers. - The foundation isn't solid and some of the bricks are shifting. There are places where the patio dips down. It is just a flawed patio. Since the patio is too small, the garden designer came up with a plan for a bigger patio. That means this stand of ferns with some lily of the valley mixed in had to be moved or the patio guy would dig it all under. I dug out all those ferns this evening, loaded them up into the truck and took them to my sister's. garrden. No, I am not aware of any garden fairies hitching a ride over there in those ferns, but one never knows. It is possible. Bless those garden fairies especially Tangle Rainbowfly, wherever he is. 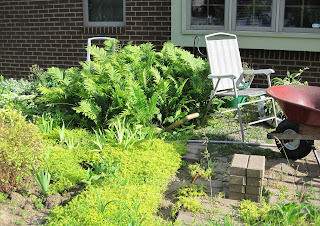 They have dogs and kids over there, but lots of shade, so the ferns should be happy. 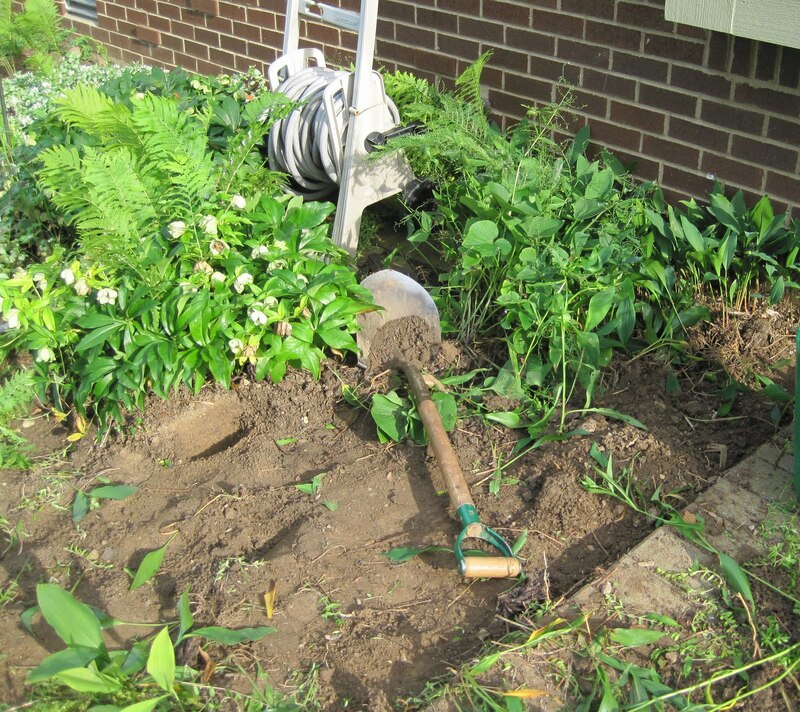 I need to do a little bit more digging up of plants in that area, including digging up a large established Helleborus, before I'm ready for the patio guy to show up and start work. You can also see the stack of pavers in the picture above. The patio guy has designed the patio so that we can reuse all those pavers. Good idea! And it will save me money, money which I can spend on plants. I have a nephew and a nephew-in-law helping out with mulching, weeding, etc. this summer, so they are going to tear out the old patio, brick by brick, clean off each brick and stack it all neatly nearby. They'll be starting that project early next week. Fun times! 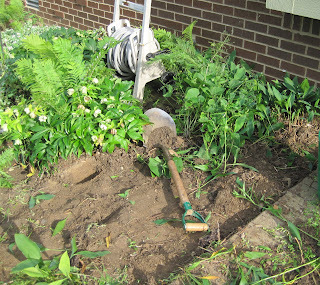 After digging up the ferns I saw all this good dirt. I paid good money to have that top soil brought in so my nephews are also going to dig most of that up and toss it a few feet over to where there will be some foundation plantings. One might argue that the value of the dirt is less than what I will pay my nephews to dig it up, but it is good dirt, so let's not quibble about that. Also still on the patio are some large containers that contain mostly the miniature hostas that were part of my miniature garden. 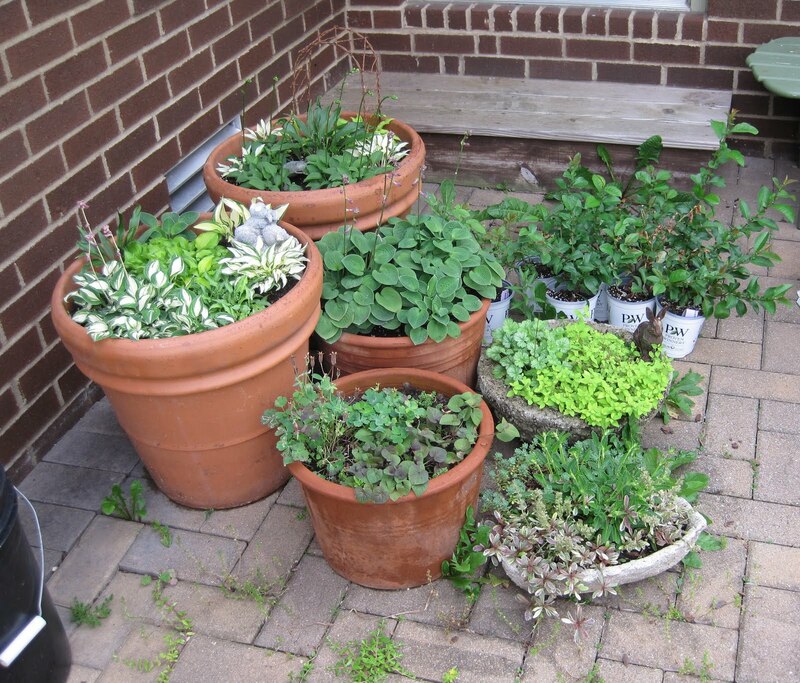 The miniature garden was planted up by the house in a planting area that was part of the original patio design. I'll move these out into the garden under the shade of a tree, along with some other plants in that picture, to ride out the summer until I can plant them someplace else. Once the new patio has been installed, I'll also replace the table and chairs with something a bit nicer. By then,maybe I can find a good deal at an "end of the season" clearance sale. And there you go, the "before" view of the patio, the major hardscape change of my new garden design. Deconstruction starts next week and then the patio guy should start on the new patio "mid to late June". I'll post updates as they build the new patio, and show the many features being incorporated into it. Now. I leave you with an image that isn't of a flawed patio, an image to cleanse your eyes. 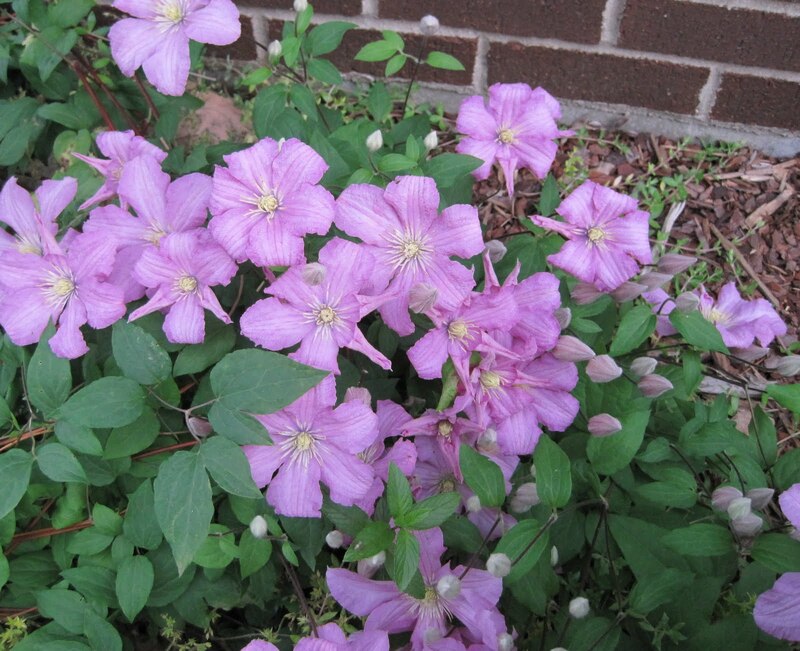 This clematis is blooming near the patio but should be safe enough during all the constructions, so I don't plan to move it. Carol, I'm so tickled for you about all the happy changes coming about in your garden! I will bring a bottle of champagne to christen that patio when I visit Indianapolis in 2011! Yes, I know it will be a year old by then. No harm in letting the baby mature a bit! I was exhausted just reading that post. Let's get it done and start partying!! The whole project is so exciting. Can't wait to see the new patio. The patio reno sounds very promising - I'm sure you'll be pleased with the outcome. If you remember to take photos from a fixed location, you can eventually make a slideshow of the project progress, which is fun to watch. I don't think I ever knew you had all that brick...I love it! I can't wait until the big patio reveal...it sounds wonderful. Looks like a wonderful project you have going! Ahhh...my patio has most of the same flaws as yours, except my weeds grow bigger. When I bought the house I didn't even know there was a patio! I've been fighting with it ever since. Maybe your project pics will be the kick in the pants I need to get my own redone. Keep 'em coming! This sounds great! Maybe next year you can have the family Easter gathering out on the patio! I can't wait to see what you do with that patio. I bet it will be so relaxing and beautiful. My eyes are so at ease with a look of that last photo. Your patio redesign will be so good no doubt. When you have your family over for the big egg hunt everyone can sit on the patio and watch the action. Can't wait to see the flower beds. One must never underestimate the value of good dirt. I'd move that precious stuff too. Sign of a true gardener, I'd say. Just found your blog and I'm enjoying every moment here!! I love your "Night Blooming Cereus" I had a chance for one and turned it down, hindsight! And your patio project is also a big winner. Alot of work-ugh but final results are always worth it!! And I love your mini. hostas I only have 2 and baby them so nothing happens to them. They are hardly little things. I like how you put them all together. Again, great blog.